How did medieval and earlier potters fire their wares? The technology is poorly documented and the archaeological record difficult to interpret. Set up by Oliver Kent and David Dawson in 1981, the Bickley Ceramics Project has built and fired numerous wood-fired pottery kilns on a farm in Somerset. Some were built to explore basic principles, others to reconstruct kilns from specific excavations. The project has become the longest running research project of its kind and has contributed widely to historical research through conferences and publications as well as to contemporary ceramics. After 30 years, the project closed at Bickley in 2010. Both David and I were actively interested in archaeology and in ceramics and had met at the City Museum in Bristol where David was curator of archaeology. By 1981, I was teaching ceramics at the School of Art. Our shared interests in medieval and later pottery and awareness of the reality of making and firing ceramics resulted in an ongoing debate about the history of ceramic technology and the state of research into the subject amongst archaeologists at that time. It seemed to us that too much imagination was being used in the interpretation and reconstruction of excavated potteries but little exploration of basic principles or contemporary examples. Above all an awareness of the skill and experience of potters was lacking. What emerged was an interest in using practical research to test and develop on existing ideas. The mismatch between the reality of firing pottery and much of the experimental work that had been carried out by archaeologists at that time was very evident. One evening in the Eldon House pub in Clifton, a challenge was set. Find a field and try building some simple updraught kilns, not to reproduce pottery but to understand principles. Mary Campbell, then working at Bristol City Museum, heard of our plans and generously offered the use of the overgrown orchard at Bickley for two weeks in August 1981. Once started, the project aims evolved to become more ambitious. Ideas were disseminated initially through the Experimental Firing Group set up by Anne Woods at Leicester University. The positive reaction we received encouraged us and the combination of potters, scientists, and ethnographers as well as archaeologists at the day conferences at Leicester helped to expand our awareness. As we became more confident, we embarked on actual reconstructions from archaeology and took our work to major archaeological conferences and to events such as the International Ceramics Festivals at Aberystwyth in 1987 and 2005. 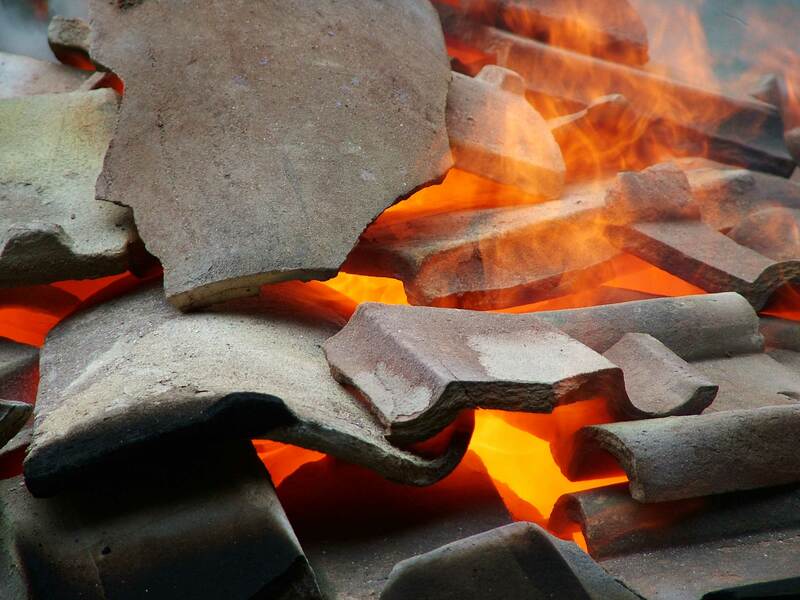 We advise and report on archaeological excavations and historical projects and have been commissioned to build kilns by a variety of bodies including English Heritage. A replica of a 17th-century kiln built for the Plimoth Plantation museum in Massachusetts in 2001 was regularly fired by the potters there until its demolition in 2014. Bickley’s identity has had another central element – its people. Many of them have returned year after year, making thousands of pots, gathering tons of wood and scorching themselves before the fireboxes. They have visited archaeological excavations, standing kilns and demonstrations at Leicester University with us as well as helping fire some of the kilns we have built in other places. The community emphasised the team nature of any such enterprise be it now or in the past. This summary is adapted from David Dawson, Oliver Kent, Vicky Dawson and Heather Kent, 2012. The Bickley Book: The Bickley Ceramics Project 1981 – 2010. Bickley Ceramics Project/blurb.com. Click here to view sample pages and purchase as a book or ebook from blurb.com.